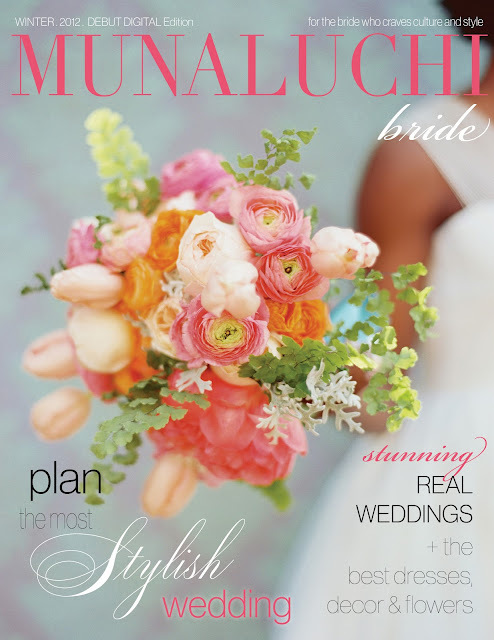 Munaluchi Bride will be debuting their quarterly digital edition tomorrow February 21st! The Winter 2012 edition of their amazing publication will hit digital newsstands on issuu and will be released soon through the iTunes store for iPad, iPhone, and android devices. The Winter 2012 edition cover features the stunning bouquet by Janie Medley of The Bride’s Café and JM Flora Design, a gorgeous Veronica Sheaffer gown, and photographed by Amelia Johnson. You will find beautiful real weddings, expert planning advice, the latest in bridal fashion, along with 20 pages of the editorial style shoot that grace the front cover of this debut digital issue. We can’t wait to see the creative work of photographer Amelia Johnson, event stylist Dana Fitzgerald, floral designer Janie Meldey and calligrapher Moya Minns of MM Ink. Subscribe to Munaluchi Bride's digital newsstand to get an instant update once it goes live. Until then enjoy the teaser! !